Hosted by Tennessee Valley Authority (TVA) and in partnership with The U.S. Department of Energy (DOE) Weatherization Assistance Program (WAP), the Home Performance Coalition (HPC) presented the 2017 HPC National Home Performance Conference and Trade Show at the Omni Hotel in the heart of Nashville, TN. 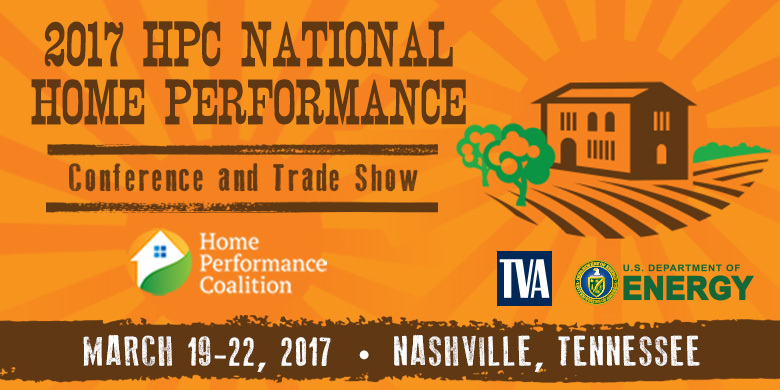 The biggest in HPC's 31 year history, with over 1,900 attendees, 175 sessions and workshops, 270 presenters, over 50 exhibitors and 25 sponsors, this national conference was a true success! ~Read this note from Bethany Dittmar, Director of Education & Events about these session presentations. CEU credit information was sent to accrediting bodies by April 30, 2017. A warm and grateful thank you to our sponsors, exhibitors, presenters and attendees!